This is HIDDEN BRAIN. I'm Shankar Vedantam. Unpredictable things happen to us all the time. Your car breaks down. The babysitter cancels. You get sick. Those little moments shift the direction of your day or your week. And then there are the bigger things in life, the earthquake kind of change that shakes everything around you, that breaks down your sense of who you are and what your life is. And in the process of getting back on your feet, you might realize that something's different. Maybe you come out of it with a new perspective, a sense of direction you never imagined. Today on the show, we have two stories of that kind of change and the transformation it brings. Oh, and we have some pretty beautiful music that comes with those stories. VEDANTAM: Derek Amato is sitting at the piano at NPR Studio 1. As you're listening to him play, you might think he's had years of musical training. But Derek is unusual. He's said to have something called acquired savant syndrome that left him with the incredible ability to play the piano. We'll talk about what that means, but let's back up a minute. AMATO: I grew up a typical kid. I was an extremely aggressive athlete, so that was kind of my thing. I was a baseball, football, basketball player. VEDANTAM: You were a jock. AMATO: I was a jock, yeah. I had musical interest from very early on. My grandmother was a organ player for the church. So, you know, I was around it. I would - I remember Sunday mornings going, sitting next to her on the bench. And even though I didn't understand, you know, what she was doing or how to play the instrument, I loved to sit with her and sing. And it was just - it was my comfort zone as a child. When I'd go to church, I'd get to sit and watch her play the organ and sing. VEDANTAM: At his mother's insistence, Derek dabbled in music. He joined the school band, played drums, tinkered around with a guitar, formed a rock band with friends. But he did not take formal lessons or get any musical training. OK, so that's the setup. What happens to Derek in 2006 is both terrifying and fascinating. He was in South Dakota visiting friends and family. AMATO: I got together with some friends, and we were going to have a little barbecue party at the pool, an indoor pool. And we were horsing around, and this young man walked in. He must have been about 14 - 12, 14 - and he had this little miniature football with him. So, of course, we started throwing the football at each other, and I started - I thought I could just run on the side of the pool and then dive over the water and catch the football in the air. VEDANTAM: And the idea was you would catch it and then fall into the pool, yeah. AMATO: Yeah, just catch it in the air and then fall into the water, and so I went running on the side of the pool, and I remember. I remember running alongside of the pool. I remember even diving in to catch the ball. And I knew I was diving towards the shallow end. I was very aware. And I miscalculated the depth, obviously, and I hit the upper left side of my face. And that's all. I remember - it was like an explosion. And, you know, we've all - most of us have had a head trauma when we were a kid or hit our head, and it's that sickening feeling you would get when it's like, oh, no, I know something - I just did something extremely wrong, and this isn't right. And I knew I had hurt myself. The diagnosis was a massive concussion. VEDANTAM: And what was the treatment? AMATO: Relax, stay quiet, lay in bed for a few days. I spent the night at the hospital, and the next morning, they sent me home. I went home, and I slept. I slept for five days, basically. VEDANTAM: And then you get up and do what? AMATO: I was sitting at the table, and I said, well, I feel pretty darn good. I know I had an accident, and I'm not sure what happened. And I said, well, I'm going to pack, and I think I can go back to Denver in a couple days. So I called Rick, and I said, why don't you come over and get me? We'll say goodbyes, and I'll be on my way in a couple days. And so we went over to his apartment, and we were just hanging out, and he had this tiny keyboard, just this little piece of junk in the corner, and it was just on the stand, dusty and not sure if it had ever been played. And I kept staring at it as we were talking. And then we were sitting, talking just like this, and I kept looking at it and looking at it, curious. It was like - not sure why I was drawn to it. And I finally just walked over to it. And I thought, I'll just hit a few of these keys. I turn it on and see what happened. I had no clue. And I sat down, and my fingers just went crazy. My fingers were like somebody just - I don't know. Rick said the ghost of Beethoven jumped into my body (laughter). I don't know how else to explain it. I went crazy and just played and played, and it wasn't like I was just picking away. VEDANTAM: What did you play? AMATO: I played - I think it was more of the (playing piano). And it had this more of a classical structure to it. And I sat there and did this for, I don't know, five, six hours without stopping. And we just - I remember looking at him, and there were tears rolling down his face. I mean, he's a Christian kid. He's a pretty emotional guy. He's a sweet, sweet man. And he just - you know, he didn't know what to think as - because, I mean, I've known him since we were kids, and he had never seen me play a piano, so he's like, what's going on? I'm not sure what's going on. I didn't want to stop playing because I was like, well, what if I stop and then this doesn't happen tomorrow morning? I mean, this is kind of cool. I don't - I mean, it doesn't happen every day you just sit down and start playing a piano, so I think this is kind of different. Let's just stay here for a while. It must have been 2 o'clock in the morning, and I was exhausted. My brain was flying still. I was racing. And so he took me back to my mother's house. We had to call it a day. I was, you know, beat up, and I went to bed. And the next morning, I woke up, and I was paranoid. I was nervous. I was scared. I was like, how am I going to tell my mother, the person that knows me best on this planet - I just hit my head, and I'm a little whacked out, how am I going to tell her that I just discovered that I know how to play the piano fairly well to a person that's known me my entire life, 40 years? So I said, well, I don't know any other way than to take her to a music store. So I said - we had a cup of coffee, and I said, let's run to the music store real quick. And she said, what do you want to buy? And I said, nothing. I said, I just want to show you something real fast. I wouldn't tell her. We get to the music store. We walk in. The salesman says, I don't know, like, you know, he - can I help you? He wants to sell me something. And I said, if you show me how to get this piano, this digital piano on, that's all I need, and then give me just 10 minutes. So he turns it on, shows me how to turn the darn thing on. I tell my mother to sit down next to me. AMATO: I don't quite remember what I played that time, but I was doing more of a - I wanted to sing to her for some reason because it was such an emotional thing. And I was going into like (playing piano). And I just started to kind of chord this. And she was looking at me like, well, when did this transpire? And she - I mean, she had all kinds of questions right away. And then I just kind of went nuts and started going crazy just to show her, well, look at this. Look at this. And she started crying. She really didn't say much. It was a very quiet drive home. VEDANTAM: It could not have happened. AMATO: ...Or work in the fighting business, so I don't know. I - and you know what? I invite skepticism because I think when something so beautiful and profound happens, we have to question. VEDANTAM: At what stage did you stop questioning that you had a skill? I'm assuming that you were skeptical as well. I mean, you told me that when you went home the first night, you were afraid that it was going to be a one-day skill, and it was going to be gone by the next morning. At what point did you stop questioning it and say, this is actually a new skill that I have? AMATO: You know, I think you kind of grow into that, getting comfortable with accepting what's transpired in your life. I definitely didn't want it to go away. And the first year or two, it was a little, you know, like I would wake up thinking, I need to get to a piano. I need to make sure it's still here. And then as time went on, I started to understand that - well, the doctors tell me it can go away as fast as it came. And acquired musical savant syndrome, that means you've acquired a gift. And I got to that point where I just accepted the fact that I'm going to enjoy every second of this because if I wake up tomorrow and it's gone, I want to be able to say that I did the best I could to display it to a society looking in at my life and saying, I've been inspired by this, or the human potential is amazing, or the brain is just a magnificent, you know, organ that we don't know anything about. And I think it became that comfort in knowing that I'm going to enjoy it every single second. And if it stays, beautiful. If it goes away, then I guess I'll go get a job. VEDANTAM: Have you spoken to neurologists who are skeptical about what's happening to you? AMATO: I think they're all skeptical the moment they walk in the door. VEDANTAM: ...And you seem like a trustworthy person. AMATO: Right. Right. I expect you to be. VEDANTAM: But I have the feeling that you're just - this is just one big giant prank. AMATO: Well, that's because I'm still - I'm articulate, and I still have most of my marbles. So I can display this story in a different way than, let's say, the guy that hit his head and woke up a piano player, but he's not all here. VEDANTAM: If I asked you to play "Twinkle, Twinkle, Little Star" for me, could you try that? AMATO: I don't think I can play it. I tried to do "Happy Birthday" for a person the other day, and I couldn't figure it out. (Playing piano). No, answer's no (laughter). AMATO: Is that this one right here? (Playing piano). Oh. (Playing piano). Wait. (Playing piano). Where was that first note then? (Playing piano). Wait. (Playing piano). Where - oh, so it's all up and down? (Playing piano). Gosh, darn it. I can see it now. (Playing piano). I mean, that's kind of in there. AMATO: Thanks for the first note, though. VEDANTAM: ...Without knowing the basics. AMATO: I'm right there with you. I'm on your side. I'm fascinated with that, too. VEDANTAM: Does it disturb you? Does it worry you that you have this ability? AMATO: No. I mean, I'm a Christian kid, so I think this is where God wants me. I think this has already been panned out, my story. I - how else - I mean, I have to live with this every day, so if I sit and beat my own mind up about is this nature versus nurture and nature and all this nonsense - but I mean, I've talked to the best doctors, the smartest doctors on this planet. And they all got a different little input, and they all got something different to say about it. Most all of them are skeptic when I walk in, and most all of them when I walk out are right here with me. VEDANTAM: Have any of them suggested treatments? AMATO: Yes, yes, they - Dr. Reeves at the Mayo Clinic, when I was filming with the Discovery Channel, he was fascinated with this as well, and he said - the best way for him to explain it is like a roller coaster. If you get on a roller coaster that doesn't stop, sooner or later, it's going to get tiring. So maybe we suggest slowing down the stimulant, the overstimulated brain. You're firing these neurons at a pace that's unheard of. So let's try some seizure medication to shut those down, right? I don't know - understand how it works, but I do know it slows down the firing of the neurons. Why would I want to take synthetic drugs and mask something possibly that I'm enjoying to the point where I don't want it to slow down or go away? I'll take the hyperness and the ADHD and the OCD and all that garbage that comes with this maybe. AMATO: Then I guess I go down on fire, baby. AMATO: And that's how the story ends, and I'm good with that. VEDANTAM: You are still the guy who would dive for the football over the swimming pool. VEDANTAM: Of course, Derek Amato isn't the only person with acquired savant syndrome. Others have experienced the profound changes that come with this condition. SCOTT BARRY KAUFMAN: They are so motivated. They are in love with what they're doing. It's almost like an extension of who they are. VEDANTAM: Also I'm going to challenge Derek to play the studio wall. AMATO: I see - on this wall, I see these squares. Some of them have different depths. So the full squares almost feel like a whole note to me. VEDANTAM: Keep listening. It'll make more sense soon. VEDANTAM: This is HIDDEN BRAIN. I'm Shankar Vedantam. This week on the show, we're looking at the specific moments people lose something big and how that change can point them in new directions. Before the break, Derek Amato told us the story of how he became a musician after a head injury. Before the accident, he couldn't play the piano, but after, his musical talent was just undeniable. If this is the first time you're hearing our show, I have a confession to make. I'm a card-carrying rationalist. When surprising things happen, I don't call them miracles. I look for explanations. Derek's very charming. His story's amazing. But I found myself asking over and over how something like this could happen. That's when I came by a couple of researchers who've spent years studying people who've suddenly acquired savant-like gifts. Darold Treffert is a psychiatrist in Wisconsin. He studied Derek. DAROLD TREFFERT: And I must say that in his case, I am, you know - I was as startled as you about the fact that he went to the piano and knew where to place his fingers and so forth. The reason that I'm inclined to accept that is because I've seen that in some of these other cases, although probably not quite as abrupt as he. But - and to me, at least, that having seen a lot of savants, when I see some of these acquired savant cases, it is really quite jarring. VEDANTAM: I don't know if you remember what Derek said about his injury. He leaped across the swimming pool for the football, and when he came down hard, he heard what sounded like an explosion. AMATO: And I miscalculated the depth, obviously, and I hit the upper left side of my face. VEDANTAM: The left side of his face, that's an important clue. TREFFERT: In general, in savant syndrome itself, whether congenital or acquired, there tends to be a more left brain injury with right brain compensation, and the right brain areas or abilities that seem to emerge have to do with art, music and mathematics, actually. VEDANTAM: Art, music and math - all skills that involve pattern recognition. At the University of Pennsylvania, cognitive psychologist Scott Barry Kaufman said, think about it. These are the skills you might imagine are built into the architecture of the brain. In other words, we might come hardwired for certain kinds of activities. This is the insight that helped me see that Derek might not be pulling a prank. Most of us, in fact, effortlessly learn things. Just like Derek says he never took classes to learn piano, you probably didn't take formal lessons to learn your first language. KAUFMAN: The truth is that a lot of things we learn in life were not done deliberately. When we were very young and between, you know, the ages of 2 and 4, we learned a huge amount of new words and learned the grammatical structure of our language automatically without - we didn't, like, sit down when we were 2 years old and say, right, I'm going to learn all the grammatical syntax and what it all means and - so we have these structures that help us learn. VEDANTAM: If you look at it this way, most people have skills that might seem savant-like to a visitor from another planet. We learn these skills effortlessly. In fact, it doesn't even feel like learning. It feels like fun. What makes savants unique, in other words, is not that their brains do amazing things. All brains do amazing things. What's different is that they're demonstrating effortless learning in domains that usually call for sustained effort. Now, I'm not going to tell you you should go out and bang your head against the floor of a swimming pool to learn to play the piano. The vast majority of concussions don't produce an inner genius. They have terrible outcomes. But Derek's story does suggest, even to this card-carrying rationalist, that we have worlds within us, gifts that we do not realize that we possess. KAUFMAN: When I look at these savants, what I see at the core that I think is - offers a lot of inspiration to humanity is that they are so motivated. They are in love with what they're doing. It's almost like an extension of who they are. To me, that is - offers a lot of hope, inspires me that perhaps all of us can find that vehicle that really allows us to sing. VEDANTAM: As Derek was playing the piano in NPR Studio 1, I noticed there was a wall behind him. It had soundproofing, hollow wooden cubes, each of a different depth. Derek had told me that when he plays, he sees squares floating by him. So I asked him to turn around, look at the wall, and tell me what he saw. VEDANTAM: I asked Derek to play the wall for me. AMATO: I see low notes because all the depth. You see the dark ones that are filled in all the way? They stand out. So I see low notes like (playing piano). Now I'm in the middle boxes. See where I'm at now in those middle boxes? So those are (playing piano). And that's a whole different - now we're going into a whole different thing. Now I'm getting excited (laughter). You got any more walls to look at? VEDANTAM: So you were just playing the wall? That's what you were playing, so playing music on the wall? AMATO: I was playing what I - so I started here, OK? So imagine that's the music bar. AMATO: ...If I have walls like this at my house. VEDANTAM: Are you telling me that you have never played the piece of music you just played for me in your life before? AMATO: No, and I - and this third row might even be a whole different composition. That's what I'm saying. The depths of those blocks - those middle rows and those circles in the middle, that's what these are to me. That's what (playing piano). Those are rolling patterns to me. And then those chunky ones on the top, that's where I see that (playing piano). And it just changes like that suddenly, and then I move down to the next one, and it's a whole different flow. (Playing piano). VEDANTAM: That was musician Derek Amato, who acquired his piano skills after accidentally hitting his head. For Derek, everything changed when he gained an incredible talent. His life now points in an exciting, new, musical direction. But sometimes the most valuable moments are when something's taken away from you. In those times, you can see a different kind of growth - growth from subtraction, renewal from loss. MAYA SHANKAR: I was really devastated to lose something that I was completely in love with and so passionate about and that had really constituted such a large part of my life and my identity, you know? I was first and foremost a violinist. VEDANTAM: This is Maya Shankar. In one important moment, her whole life changed. SHANKAR: My grandmother was an Indian classical violinist. And so my mom had her old violin in our attic for many years. VEDANTAM: Maya's story begins in an attic in Connecticut and eventually brought her to the Obama White House - but more on that later. SHANKAR: Each of my three older siblings had rejected the violin, saying that it wasn't cool enough. And my mom finally gave me the instrument. And I was immediately taken kind of by the tactile sensation of the instrument - I mean, the wood and the bow. I just loved the feeling of playing the violin. VEDANTAM: Maya's mother didn't know much about Western classical music. But she signed up her daughter for lessons using the Suzuki method. The focus was on playing by ear and making beautiful sound. Maya practiced constantly. SHANKAR: I had a special schedule at school to lump all my classes together so that I'd come home a little bit early and get a little bit more practice in. And especially with all the traveling, most days were devoted exclusively to music. VEDANTAM: She got good - very good. Now, the part of her musical education that was missing was the formal part. She didn't know how to read music very well, but she had a fine ear, and she had ambition. In the pursuit to find a teacher who would take her to the next level, Maya's mother did something quite daring. SHANKAR: Yeah. So my mom - she was really a go-getter when it came to my violin life because, like I said, she didn't really have a lot of experience or exposure to the music community and kind of had to innovate in order to find opportunities. SHANKAR: Why don't we just go to Juilliard? I mean, why not, right? What can we lose? VEDANTAM: Just walk in the door? SHANKAR: We just walked in. So we walked into the building. And just by happenstance, we happened to run into a student in the elevator who studied with a music teacher. And my mom talked to that family in the elevator and said, would you mind if we just had about five or 10 minutes at the end of your lesson where Maya could play for your teacher? And they were really gracious. And they said, sure, no problem. VEDANTAM: Well, of course, you know what happened next. Maya played for the other student's music teacher, wowed the teacher and got accepted into a summer program. Soon she was taking classes at Juilliard. She was playing with other talented musicians. She was even being featured on NPR. CHRISTOPHER O'RILEY, BYLINE: Joining us now is the Juilliard pre-college violin quartet. They are 17-year-old Emilie Gendron from Glastonbury, Conn., 15-year-old Maya Shankar from Cheshire, Conn. - Maya, by the way, is a From The Top veteran. She's been with us since the early '50s. VEDANTAM: That was Maya on NPR's From The Top. She had found her classical music home. She was talented, hardworking, and the path before her seemed clear. SHANKAR: I really wanted to be a violinist. I was so passionate about it. I never felt more comfortable than when I was performing. For some reason, that's where I experienced flow and, you know, the ability to spend a lot of time, you know, practicing and trying to perfect the art. And then you go on stage, and you kind of just surrender. And, you know, you play to the best of your abilities. There's just something beautiful and elegant about that process. And I just really, really loved it. VEDANTAM: She was so good and so enthusiastic that opportunities kept presenting themselves. One day, her teacher at Juilliard arranged for her to play for a famous violinist - a very famous violinist. SHANKAR: I nearly fell over in my seat because no reasonable musician thinks they're going to get the opportunity to meet Itzhak Perlman, let alone play for Itzhak Perlman. VEDANTAM: Do you remember what you played? SHANKAR: I played the Barber "Violin Concerto." I played the first movement. VEDANTAM: Itzhak Perlman decided to take her on as a student. SHANKAR: In addition to Saturdays, I was also going to New York multiple times during the week, either for studio classes at his home in Manhattan or for private lessons or chamber music lessons. And at that point, it was very clear to me that I wanted to become a concert violinist. ITZHAK PERLMAN: Well, I remembered that she sounded - she had a very lovely way of making music. And that, for me, usually is the most important thing. VEDANTAM: To concert violinist Itzhak Perlman, it was OK that Maya had learned to play music by ear rather than by reading music. The technical stuff was important, but it could be learned. PERLMAN: You know, it's more important for me to have somebody musical. And let's say that technique-wise - you know, you have to work on the technique. But the important thing is the music. And I felt that she had a very lovely way of phrasing and so on and so forth. And so we worked on that. But then we also worked on, you know, how do you accomplish, technically, certain things? For example, the Barber "Concerto," the last movement is a little bit tricky. So how do you practice that? VEDANTAM: But Perlman didn't just teach Maya how to play the violin. He taught her something much more important - how to teach herself to play the violin. SHANKAR: I remember at lots of lessons where instead of telling me, Maya, OK, clearly, you're unsatisfied with that phrase, here's what you should do to make it better, he would instead say, Maya, clearly, you're unsatisfied with that phrase. What do you think you should do in order to make that phrase better? Let's talk about it. Let me hear what your aspirations are for the arc of this musical phrase. What tools do you have at your disposal, either with your bow arm or your vibrato or your tone, in order to make it beautiful? And it's really frustrating. I mean, in the moment, you're thinking, OK, man, like, you're the expert here (laughter), you know? VEDANTAM: Just tell me what to do. SHANKAR: Can you please just tell me what to do, and make this easier for both of us? PERLMAN: So the more you learn to think for yourself and to try and solve problems on your own, the better it is for you for the future. VEDANTAM: It was all going so well. 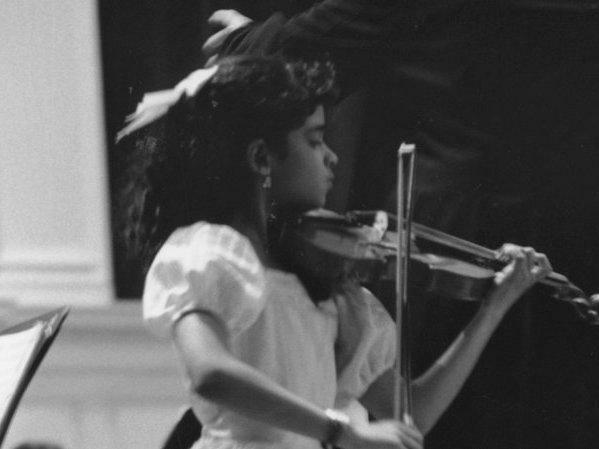 When Maya was 15, she was practicing at a program run by Itzhak Perlman. SHANKAR: And I was playing a passage from a very challenging Paganini caprice. And I simply overstretched my finger on one note. And I felt a - kind of a popping. And so I overstretched the tendon. And it didn't really heal as expected. VEDANTAM: And so how did you spend the next months? What did you do? SHANKAR: Well, Mr. Perlman was such a gem. Because I'd injured my left hand, he continued to teach me violin just with my bow arm. So for over a year, I went to him. And we just worked on perfecting my bow arm. And I would just play open strings in every lesson. And he would teach me about how to produce a beautiful sound. PERLMAN: You know, you always feel that, you know, it will resolve itself. So usually, what happens - if one hand doesn't particularly, you know, respond or anything like this, you work on the other hand just, you know, not to waste time, just to do - so if you've got your left hand and there's a problem, then you work on the right hand and vice versa. VEDANTAM: Do you remember anything about Maya's attitude as she was dealing with this, as a student? PERLMAN: You know, her attitude was - you know, I mean, obviously, she wasn't - I mean, I'm sure that she wasn't feeling good about it. But it was never like, what's the use? VEDANTAM: Maya's hand didn't heal. Doctors finally told her she had to stop playing completely. SHANKAR: I was really devastated to lose something that I was completely in love with and so passionate about and that had really constituted such a large part of my life and my identity, you know? I was first and foremost a violinist. And so I was anxious because I was worried that I would never find something that I felt as passionately about as I did with music. VEDANTAM: Just like that, Maya's dream to become a concert violinist was over. Back home for the summer in Connecticut, she started to ask herself how she could pick up the pieces. Would she ever find anything that could make her as happy as the violin? SHANKAR: What we found was a 9 percent increase in college enrollment rates as a result of eight text messages. I mean, that is really profound. Eight text messages is what I send my best friend on any given day. VEDANTAM: To find out what Maya did, stay with us. VEDANTAM: This is HIDDEN BRAIN. I'm Shankar Vedantam. This week, we're looking at loss and renewal. We're zeroing in on the unexpected moments in life that shift our trajectories. Before the break, a young violinist named Maya Shankar learned that she could no longer play her instrument because of an injury in her left hand. Up until this point, her whole life had revolved around music. Not knowing what to do, Maya retreated to her parents' home in Connecticut. Her life felt in disarray. SHANKAR: The summer before, doctors basically told me I had to stop playing completely. And just by luck, I was helping my parents clean their basement in Cheshire, Conn., and I stumbled upon an old course book of my sister's. It was called "The Language Instinct" by Steven Pinker. VEDANTAM: Maya started reading. And the more she read, the more excited she became. SHANKAR: It was remarkable for me to learn about just how complex our minds were and just what was required in order for us to have our day-to-day experiences. And so it really whet my appetite for learning more about the mind and for exploring in more depth kind of the brilliance of the brain. VEDANTAM: She started to study cognitive science. She went on to get her Ph.D. at Oxford on a Rhodes Scholarship. She got a postdoctoral fellowship. A promising career in academia lay ahead of her. But here again came another unexpected turn. SHANKAR: So over Thanksgiving break of the final year of my postdoc, I was at home. And I was visiting my undergraduate adviser from college. Her name's Laurie Santos. And she was telling me about the U.S. Department of Agriculture's efforts to get free and reduced-price lunches - school lunches - into the hands of more eligible students. VEDANTAM: Students were going hungry because the process of getting certified for the lunch program was cumbersome. The Department of Agriculture came up with a simple idea. Instead of having a multistep sign-up system, states could use information they already had about poor families to help enroll children in the lunch program. SHANKAR: And it's just a matter of data matching and cross-enrolling these students. But as a result of this common-sense reform, you know, 12.4 million students, as of 2015, were automatically enrolled into the school lunch program and had access to lunches and were able to thrive at school. And I remember being so moved by this example. VEDANTAM: To Maya, it was magical. SHANKAR: It was just like a light bulb went off in my head. And I thought, OK, this is what I need to be doing with my life. I want to be taking research insights from the behavioral sciences and allowing them to find their way into public policy so that they can be in the service of Americans and people around the world. VEDANTAM: So how do you break into the world of policy when you're just a lowly postdoc? Maya knew nothing of politics. She didn't have connections in the world of government. But she did remember a lesson her mother had taught her standing outside the Juilliard School years earlier. She tracked down an email address for Thomas Kalil, who was helping the Obama administration with its science policy. SHANKAR: I sent Tom, again, a cold email (laughter). VEDANTAM: This is the Juilliard method, again. SHANKAR: This is the - this is my mom's Juilliard - I need to give her full credit for this. SHANKAR: She is totally fearless and kind of inspired this trait. And I went over to his home. And he asked me to pitch to him ideas that I had around interventions where behavioral science could improve public policy outcomes. VEDANTAM: What did you tell him? SHANKAR: I talked to him about a number of things, like the importance of using social norms to motivate behavior. So we know from research that if you tell people that their neighbors use less energy than they do - right? - they're more likely to use less energy. And there's a lot of domains in which just telling people what the data shows about people's actions and decisions can actually drive actions that are more in alignment with people's long-term goals or with policy objectives. And something that struck me about that conversation is I had been talking for years with my academic colleagues about the potential applications of using behavioral insights to improve people's lives. And this was the first time that, when I told him an idea that I had, his response was, oh, we can find a way to do that. VEDANTAM: When I interviewed Maya in the fall of 2015, President Obama had just signed an executive order announcing that the White House was going to build behavioral insights into policy. Maya became senior adviser for the social and behavioral sciences at the White House. And in her new role, she was able to work on SNAP, the school lunch project that initially so inspired her. I asked her to explain what they were working on. SHANKAR: So we have been working with the U.S. Department of Agriculture and also local school districts to redesign communications that they're sending to families to help promote the verification process so that their kids can stay on the benefit. So we've done a few things. So there's a few behavioral insights that we used. One is we've taken a very long list of, you know, action steps required for verification and condensed them into three easy-to-understand steps that you can take. Two, we've worked with school districts to translate the communications into multiple languages in order to support comprehension among the diverse population that this program serves. One issue is that, at present, families might only think the way to recertify or to verify their information is to send snail mail back to the school district. And instead, there's the opportunity for them to take a picture of their information using their mobile phones and actually email it back. And we simply notified people of the opportunity to go through that process. And then, in other instances, we included prepaid envelopes to help ease the process of verifying eligibility. VEDANTAM: So I'm trying to think about why it is we often have trouble sort of thinking about programs like this because, as someone who has been interested in human behavior for a while, it seems to me that programs like these really are, you know - no pun intended - a no-brainer, that this is really something that we should be doing. It seems obvious that we should be doing it. But I think part of the issue is that I think many people might say, if you want to stay in a program that's giving you benefits and these are the steps you need to do in order to get the benefits and you deserve those benefits, rationally speaking, you should be willing to do those steps in order to get the benefits. And I think it fails to take into account the difference between how human beings are supposed to behave as rational creatures and how they actually behave. And I feel like that's the central divide that your work is trying to bridge. SHANKAR: And I think, additionally, you know, the onus is on the government to present information clearly, to present choices clearly so that people understand what program exists and what their options are and can make the best decisions for themselves and their families. But there's one example that I wanted to point to, which is a phenomenon known as summer melt. VEDANTAM: This is the phenomenon where talented high school students who are on track to go to college at the start of the summer somehow lose their way and don't show up at college in the fall. Maya and her team have worked on simple, low-cost interventions that can help these students get to college. Their idea - send the students eight text messages over the summer reminding them of impending deadlines. VEDANTAM: It seems to me that what you did and what happened to you is - actually happens to lots of people all the time where doors close and they feel like it's unbearable that this door has closed because this is where I thought I lived. And then another door opens, and you realize there are actually many, many houses in which we can live. SHANKAR: I think that's exactly right. And I think, you know, one thing that violin - one of the great blessings of playing the violin is that it allowed me to see what it really felt like to be in love with something and to be really passionate about something. And so if anything, you see sort of features or traits that are extracted in you from engaging with that pursuit. And then your hope is that, in the new explorations, those disciplines or those areas can extract those same qualities from you. VEDANTAM: I'm wondering, as you think about your own life, do you feel that your career now has been set, this is the house you're going to live in forever? Or do you actually believe, on the other hand, that there might be many other houses you will one day come to live in? SHANKAR: Well, I've certainly never been happier than I am right now working in public service and using my background to help improve people's lives. So I think that will continue to be a common theme of whatever it is that I end up doing and working in. That said, I think there are so many ways in which that passion can manifest, right? And I think that one thing the past has taught me is that there - you know, the world has endless opportunities to positively impact people's lives. And, you know, along the way, I might explore various different paths in order to get there. But as long as I stick to that core value of trying to help people and improve people's lives, I think that there are many ways to do that. VEDANTAM: And, of course, you have the cold-call Juilliard method to aid you. SHANKAR: (Laughter) Yeah. So I think that - yeah, again, thanks to my mom, I think that there is always that foolproof method of the standard cold call. VEDANTAM: That was Maya Shankar. She served as senior adviser for the social and behavioral sciences at the White House Office of Science and Technology Policy under President Obama. Since then, Maya has left the White House and become Google's first head of behavioral insights. VEDANTAM: Now, not all of us are going to be great pianists or concert violinists or Rhodes scholars or presidential advisers. But I don't think any of those things are the real point of Derek or Maya's story. I think we all have stories in our lives that reflect the fact that the people we are today are not the same people we were a few years ago. We often underestimate our capacity to reinvent ourselves. VEDANTAM: I was talking some years ago with Rick Potts at the Smithsonian Institution's Human Origins Program. He's a paleoanthropologist, and something he said stuck in my head. He told me that the thing that distinguished early humans from other species was our remarkable capacity to adapt to different conditions. Uniquely, humans live in very cold places, in very hot places, at altitude and sea level. Some of us live long periods underwater or even in outer space. Most of that isn't about our physical abilities. It's really about the mind. There's a lot of truth in that old saying, when one door closes, another opens. I want to leave you with a lovely poem by Elizabeth Bishop. Singer Aimee Mann happened to be at NPR, and we asked her to read the poem for us. AIMEE MANN: "One Art" by Elizabeth Bishop - (reading) the art of losing isn't hard to master. So many things seem filled with the intent to be lost, that their loss is no disaster. Lose something every day except the fluster of lost door keys, the hour badly spent. The art of losing isn't hard to master. Then practice losing farther, losing faster, places and names and where it was you meant to travel. None of these will bring disaster. I lost my mother's watch. And look, my last or next-to-last of three loved houses went. The art of losing isn't hard to master. I lost two cities, lovely ones - and, vaster, some realms I owned, two rivers, a continent. I miss them, but it wasn't a disaster. Even losing you, the joking voice, a gesture I love, I shan't have lied. It's evident the art of losing's not too hard to master, though it may look like - write it - like disaster. VEDANTAM: That was Aimee Mann reading "One Art" by Elizabeth Bishop. Aimee was at NPR with Ted Leo to perform for the All Songs Considered podcast. This episode was produced by Lucy Perkins, Maggie Penman and Kara McGuirk-Allison. Our team includes Jenny Schmidt, Parth Shah, Rhaina Cohen, Laura Kwerel, Thomas Lu and Camila Vargas Restrepo. Our supervising producer is Tara Boyle. One more thing before we go. We're working on a story about the placebo effect, where people can respond to sugar pills as if they were real medications. We're looking for people who have given themselves placebos and gotten better. Have you ever taken a placebo or knowingly given one to someone else - maybe a child or a parent - and seen them get better? Have you tried one and found it useless? If you have a personal story you are willing to share on the show, record a voice memo on your phone about what happened, and email it to us at hiddenbrain@npr.org. Again, record a voice memo, and email it to hiddenbrain@npr.org. Please put the word placebo in the subject line of your email. For more HIDDEN BRAIN, follow the show on Facebook and Twitter. Please be sure to subscribe to our podcast. If you know a friend who'd like to listen to our show, please send them a note or walk over and tell them. I'm Shankar Vedantam. I hope you have a happy new year. I'll see you next week. Transcript provided by NPR, Copyright NPR.